Yes it's true; it's time to play the music, it's time to light the lights, because the Muppets are back! The Muppets, titled so as to clearly reboot the brand, starts off in a modern world in which the Muppets have faded out of popularity and gone their separate ways. In a world without the Muppets, it is up to their biggest fan Walter, his big brother Gary (Jason Segal) and Gary's girlfriend Mary (Amy Adams) to reunite the gang to put on another show in order to save the Muppet Studios from oil baron Tex Richman (Chris Cooper), who wants to demolish the old studio to drill for oil. Unlike some of the more modern Muppet films (including the fantastic The Muppet Christmas Carol, and Muppet Treasure Island) this film sees the Muppets return back to their roots from The Muppet Show and the first three Muppet films (The Muppet Movie, The Great Muppet Caper and The Muppets Take Manhattan) in order to show them playing themselves in their own unique story; and boy is it good to see them back doing what they do best! 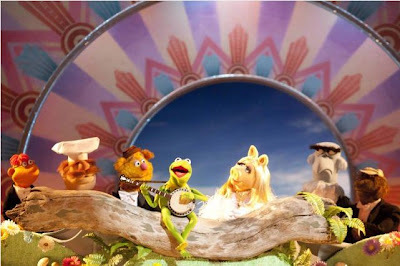 The Muppets features all of the old Muppet gang, alongside a number of celebrity cameos reminiscent of the old days of the Muppets when big household names would kill to appear on the show or in one of the films. Despite the great human characters and cameos, it really is the Muppets who steal the show and we emotionally connect with the most; there were times where I wanted to clap along with the audience in the film as the Muppets made their triumphant return, and even a few moments where I found myself with a small lump at the back of my throat too. When the Muppets finally put on their telethon spectacular in the style of the old Muppet Show, I felt a warm beat of nostalgia as I'm sure too did many of the older viewers in the audience who grew up with the show themselves. Alongside all of the many great gags throughout the film, another huge element of the film (as with all Muppet films) is the songs - which here keep up the tradition of a great Muppet soundtrack. I defy anyone to not leave the cinema humming 'Life's a Happy Song', or for anyone not to re-fall in love with Kermit and the gang during 'Pictures in my Head', and if you don't end up singing along to 'Mahna Mahna' then there really is something wrong with you! 'Man or Muppet' of course has received the most attention after its recent Oscar nomination for Best Original Song (which it is bound to win, not only because it is brilliant but because it is only actually up against one other song! ), but quite frankly all of the new songs in this film could have been nominated and would have well and truly deserved to have done so too! Accompanying the film before it starts is also the added treat of a brand new Toy Story Toon: 'Small Fry', created by the geniuses at Pixar Animation Studios. The short opens in a fast food restaurant where Buzz Lightyear is replace by a miniature happy meal toy version of himself and taken home by mistake. Whilst the toys back home are shocked to see the miniature Buzz return in his place, the normal Buzz must find a way to escape the restaurant and the happy meal toy help group for discarded toys. Make sure not to turn up late to the cinemas so you don't miss this hilarious short film. Like the lyrics from 'Life's a Happy Song' say; "I can't seem to wipe this smile off my face" - and through the entire film (and beyond) I simply couldn't! The Muppets is an absolute pleasure to watch, and enjoyable for everyone; from those who grew up watching the Muppet Show, the big fans who have been crying out for a new film like this (like myself! ), right down to those who have never even heard of the Muppets before - the film is a rare family event that everyone of all ages will love and enjoy together. It's not made with expensive cgi effects, it's not in 3D - with lots of laughs and a great songs, The Muppets is a good old fashioned cinematic treat that is not to be missed. 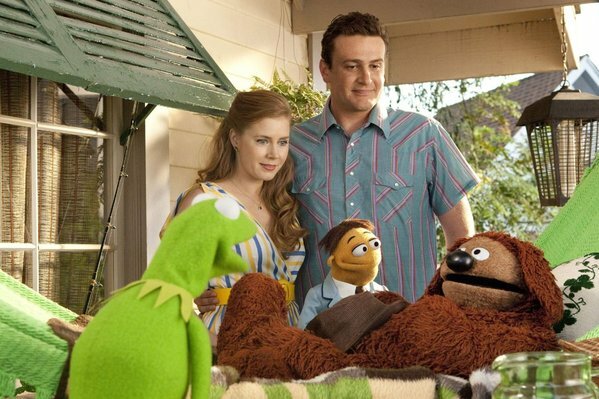 The Muppets is showing in cinemas across the UK now.